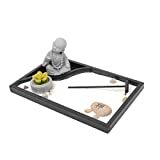 Zen gardens clear the mind of all stress, mindless thought, pressure and mental turmoil. Perfect spiritual gift for friends,colleagues and yourself. Enhance your home and garden by this grace full of peace and harmony. Used as Feng Shui gifts, wedding gifts, gifts to friends and relatives, home decoration, shops, hotels, yoga clubs decoration. The physical components of the garden are simple. 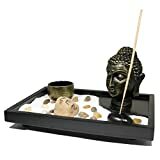 Sand represents the sea, stones represent the mountains and the wooden rake is used for tending the sacred garden.